OK. 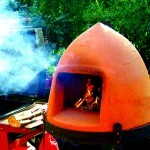 The wood-fired oven is up an ready to go. Excitement abounds, can’t wait to get going and light up for the first time. 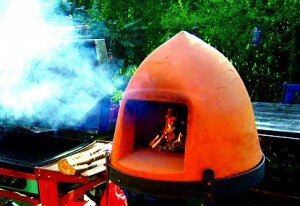 We read everything from Blistering Barbecues, the instruction and fabulous recipe book (still for sale), and I scoured the internet for any relevant tips and information on wood-fired ovens I could glean from sites such as Forno Bravo.com (and now Forno Bravo.UK). Both Forno sites have an incredible amount of useful information, recipes, books to download and accessories to buy (as well as ovens). They do a monthly email, updating everything and with a photo gallery of outdoor ovens and kitchens to die for. Makes enjoyable reading if you are into that sort of thing (which I am!). If you would like to read about the most important points that were instilled into us (Our Tips) please click here. Before using the oven for the first time to actually cook, we had to fire it up gently, with a small fire, to remove any residual moisture that might be in the oven (terracotta is porous). Right. Important things first. A large amount in this piece of writing applies to brick ovens or Fornos (basically an old Italian shed with a waist-high oven floor of stone or fire-proof bricks, which Italian ‘Mamas’ or Bakers used – so well- insulated that the outer bricks are still hot the next day). When siting your brick-fired oven in the garden, make sure you are not too close to either your’s or your neighbour’s window, or a sitting out area, as the smoke can be a bit of a nuisance at first. First and foremost, NEVER use firelighters in a terracotta oven. The interior of the oven will get coated with the residue which will spoil the taste of your oven-cooked food. The second most important point is always use dry and well-seasoned hardwood. The best way of lighting up (and a good way of using up your newspapers) is to roll or scrunch up a couple of pieces of paper, tie them in a knot – make 3 or 4 of these and mix with wood kindling in the centre of the oven floor, and, if you want, a few small pieces of charcoal. Leave the door off, because the fire needs oxygen to get it going. For your very first drying-our fire, light up, and gradually as the fire takes hold, add 2 or 3 small hardwood logs. Keep the fire going gently, and every so often add another log. Push the fire carefully towards the back of the oven. It is far better to let the heat build up gradually, and dry out the moisture, adding 1 or 2 logs as the others are dying down. Keep it going for an hour or so, then let the fire die out. If your oven hasn’t been used for a few months, i.e. over winter, when you get it out of wraps, give it the above gentle fire treatment before using it to cook or bake. Now, here it comes, the real fire, the one to enable you to cook fabulous food. Start off with the newspaper knots, kindling and charcoal in the centre, light the newspaper (first at the back, each side then the front) and gradually it will spread to the kindling and charcoal. Place just a few small logs on this, and allow it to catch and burn well. When it looks well established, using a metal poker (I use a long-handled, hand garden fork) push the fire gently towards the back of the oven. Make sure there is still a small flame, and as the fire dies down a little, add another log. Keep throwing a log on every 20 minutes or so, to keep it alight. What is important is that by now the flame licks up the back of the oven, to the top and curls back down towards the centre. The first time I got this correct, I was thrilled. You can feel if it is working by putting you hand on the outer skin – the hottest part should be at the top, just behind the point. In my beehive-shaped oven, it takes about 45 – 60 minutes for the temperature on the floor of the oven to reach 700 degrees F., which makes it the ideal temperature for cooking pizzas (see later). If the fire is too fierce, the flames will curl straight across the roof and even out of the door, so beware, it can be dangerous. If this happens, just spread the logs out to calm down the flames. When you have the fire working perfectly – the flame licking the back wall of the oven and curling up to the centre – the oven is now generating a huge amount of heat. Depending on your menu for the day, you can either roast food really quickly in the very hot central area, on a raised metal trivet or stand, or you can cook more slowly by putting heat-safe dishes on the floor, nearer the front of the oven, where it is cooler. It is also very important to keep an eye on the fire at all times – once the oven is hot, it will stay hot as long as every so often you put a new log on at the back. As you get to know your oven, you realise that keeping the fire ‘ticking over’ for a few hours means that you can cook all sorts of incredible food. Roasts, grills, great vegetable dishes, kebabs, desserts, bread – the list is endless. Pizzas only take one minute 30 seconds to cook (one minute, then using the pizza shovel, turn it around to give the other side 30 seconds), and adults and children alike love getting involved in a Pizza Party (which we are about to have in the school holidays, and will write about it). Roast potatoes, mixed with thyme or rosemary, with cloves of garlic, and gently splattered in a couple of tablespoons of olive oil or rapeseed oil are out of this world! Casseroles can be cooked slowly as the oven heat dies down, and is just kept low by spreading out the length of time between re-fuelling with a log. Just getting to know your own oven is so important. The other important thing to remember is that usually the width of the oven opening can be deceptively small – check this to make sure you have dishes or cookware that can fit through the opening. But the main thing is to enjoy it.